It all started last Thursday when Egyptian president Mursi issued a decree that puts his decisions above legal challenge until a new parliament is elected which most people interpreted as Mursi giving himself unchecked power. Mursi then sacked Abdel Maguid Mahmoud, the country’s general prosecutor, in an attempt to appease protesters demanding the retrial of officials they say were involved in orchestrating violence against them during last year’s uprising. Key opposition figures have accused the president of “monopolizing all three branches of government” and claim that Mursi oversees “the total execution of the independence of the judiciary”. Mursi’s aides replied the decree was intended to speed up a protracted transition that has been hindered by legal obstacles. It is also said to be designed in order to open the way for a retrial of people convicted of killings during Egypt’s 2011 uprising which toppled long-term president Mubarak. The ousted leader is serving a long jail term for ordering the killing of protesters in 2011, but others in his administration were acquitted. The declaration also gives the 100-member constituent assembly two additional months to draft a new constitution which is to replace the one suspended after Mubarak was overthrown. The rewrite of the constitution, which was meant to be finished by December, has been plagued by legal complaints questioning the make-up of the constituent assembly. Once completed, the document is due to be put to a referendum – if approved, legislative elections will be held two months later. But rivals condemned Mursi as an autocratic “pharaoh” who wanted to impose his Islamist vision on Egypt. The image of the ancient pharaoh was often used to describe Mubarak. 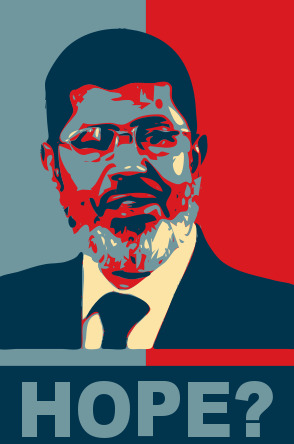 Mursi for his part said he was leading Egypt to “freedom and democracy”. State Department spokeswoman Victoria Nuland said in a statement. to ensure that power would not be overly concentrated in the hands of any one person or institution”. Mohamed ElBaradei, a Nobel laureate and head of Egypt’s Constitution Party, told CNN. wrote Ahmed Shafik, a former prime minister who received 48% of the vote in this year’s presidential run-off, on Twitter. Both supporters and critics of the president demonstrated across the country on Friday, Chants of “Mursi is Mubarak… revolution everywhere” rang out. 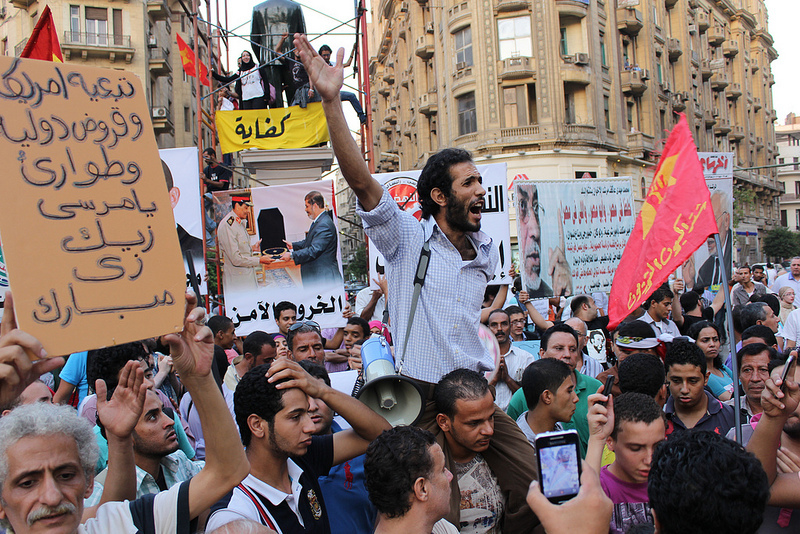 Protest organizers said more than 20 different groups had joined the week-long sit-in against Mursi’s reforms. Numbers of protesters in the square have ranged from a few hundred several thousand. The protesters basically have two demands: first, to reverse the president’s constitutional declaration, and then to dissolve the constituent assembly that is currently drafting Egypt’s new constitution . Police fired tear gas on demonstrators throwing petrol bombs. More than 100 people were injured in violence as offices of the president’s Muslim Brotherhood party were reportedly attacked in the cities of Port Said, Suez and Ismailia, while clashes between rival demonstrations took place in Alexandria. Dr. Khaled al-Khatib of Egypt’s health ministry said there were no deaths which differs from an earlier report Friday by Health Ministry spokesman Mohamed Sultan who talked of at least one death. ElBaradei said one young man is “critically injured” after being shot in the head, with more than 300 in total people getting treatment at area hospitals because of tear gas. said Interior Ministry spokesman Alaa Mahmoud. Thus far, authorities have arrested 210 protesters, 85 of whom are charged with destroying public property, thuggery and attacking security forces, the Interior Ministry said, according to state TV. Some 44 of those arrested are juveniles who are now back with their families. said one of the protestors at Tahrir square. However, most people left the square overnight, with dozens of messages on Twitter saying protesters were forced to abandon the camp after being targeted with tear gas. By Saturday morning, small numbers of people were beginning to gather in the square again. A larger protest is planned for Tuesday. In response to Mursi`s recent moves, Egyptian judges will meet Saturday to discuss their next steps, including a possible nationwide strike that would halt all trials and court cases in the country, said Judge Fekri Kharoub. ElBaradei said, adding he had met with Mursi a week ago and felt blindsided by his moves. 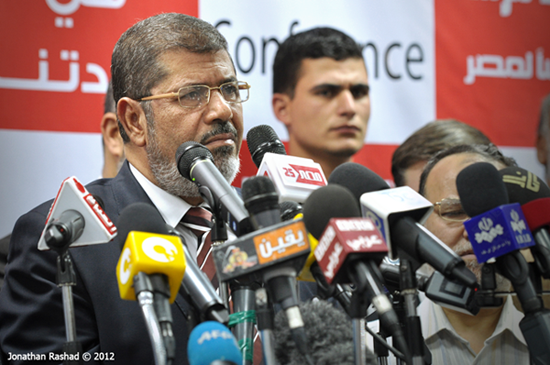 Mursi said when addressing his supporters.